If it talks like a boson and walks like a boson, what is it? Physicists Peter Higgs and Francois Englert have won the 2013 Nobel Prize for Physics for their theoretical prediction of a basic particle called the Higgs boson. The particle made news on Oct. 7, 2012, when an international team of physicists announced the discovery of a new particle that looks suspiciously like the long-sought Higgs boson. The mass question matters because the quest to explain every physical process is a core conceit in physics. The messy part is that 95 percent of the universe’s mass cannot be detected. This is one of many reasons why mass matters, and understanding its ultimate nature would be a GOOD THING. More broadly, physicists have been mussed about mass for decades: They could not figure out why the universe has it. In yesterday’s epochal announcement, scientists from the European Center for Nuclear Research (CERN) threw down a guarded gauntlet: We think we found it! The data from two giant experiments at CERN are “consistent” with the Higgs boson, without being definitive. The announcement echoes and amplifies a similar one made last December. Although the “yes, but” nature of the news may be frustrating to non-physicists, the current results satisfy the statistical standard for discovering a new particle, but are not conclusive enough to label it a Higgs. “We still have a lot of work to do to prove whether this is really the Higgs,” says Sau Lan Wu, a professor of physics at the University of Wisconsin-Madison, who heads a large research group that studies simulated particle collisions and analyzes data from the ATLAS detector. The Compact Muon Solenoid at CERN contains massive instruments for measuring the path and the energy of particles produced after high-energy protons collide with each other. Circles at vertices represent types of particles, and blue arcs represent interactions. Leptons and quarks are the matter particles; particles in the second row (photon, W/Z, gluons) mediate force, as does the putative Higgs boson. So while the new results are suggestive, no Nobel prizes are going down quite yet. After all, it’s crooked snooker to change the standards of evidence just because billions have been spent looking for one particular boson. But because finding the Higgs could mark the triumphant conclusion of a decades-long effort to describe the universe according to the “standard model” of physics, it is certain to interest the Nobel clique in Stockholm. Although the particles in the standard model behave can in baffling ways , every one has been detected — save the Higgs. The mass of the new particle, about 126 billion electron volts, matches nicely with predictions for the Higgs. Lacking this one particle, the standard model cannot account for mass, even though mass is ineluctable every time we throw a ball, run a nuclear reactor, or drop an anvil on our foot. 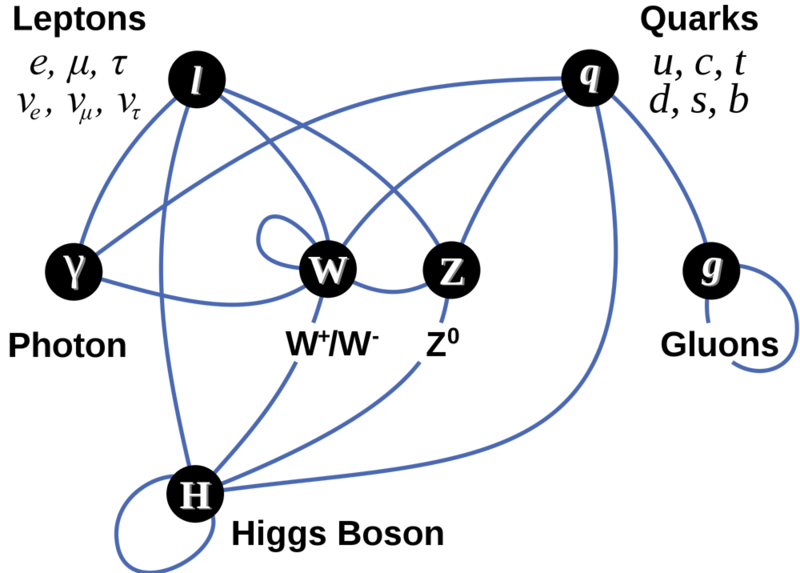 Seriously, finding the Higgs boson would substantiate the Higgs field, a hypothetical structure thought to pervade space and create mass as it interacts with various particles. 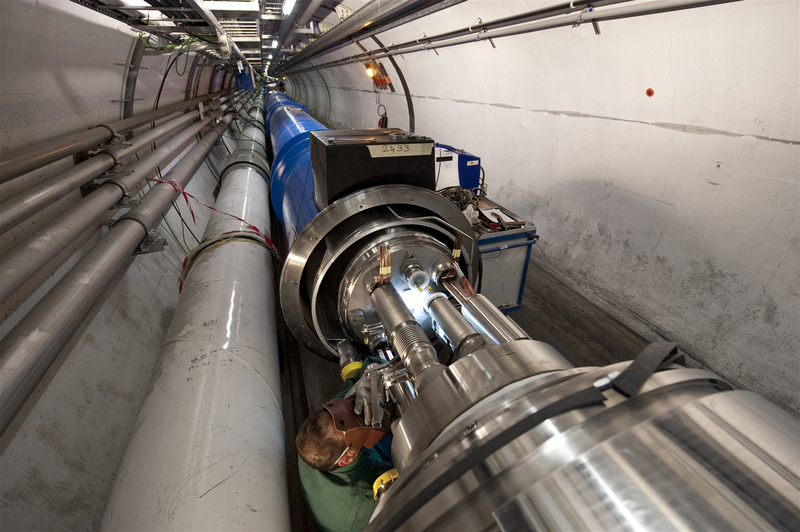 A welder connects magnets on the LHC’s giant accelerator ring. More than 1,000 high-intensity magnets guide particles inside two vacuum tubes. The Large Hadron Collider (LHC) at CERN, 27 kilometers in circumference, contains two parallel tubes holding particles that are guided by super-conducting magnets and forced to collide inside one of four detectors. Building the project took 10 years and cost north of $6 billion. Each proton can carry energies of 4 trillion electron volts as it moves close to the speed of light. Because mass and energy are convertible according to Einstein’s famous formula (E = MC2), all this energy can be converted into heavy and/or exotic particles like the Higgs. These particles, less stable than a Hollywood star, immediately decay into other particles, which enter massive, high-tech gizmos that measure their paths and energy levels. That data, in turn, allows physicists to induce the nature and identity of the original heavy particle. Higgs, the missing link in the standard model, was likely prevalent about a billionth of a second after the Big Bang 13-plus billion years ago. The collisions at the LHC mimic these extreme conditions. Earlier this week, after the LHC had announced yesterday’s impending announcement , other scientists reported that the Tevatron may have glimpsed the Higgs, although the statistics were weaker. Located near Chicago, the Tevatron was eclipsed by the LHC as the world’s most powerful accelerator, and it shut down at the end of 2011. What is the sound of many brains collaborating? The cavern holding the ATLAS detector at the LHC. 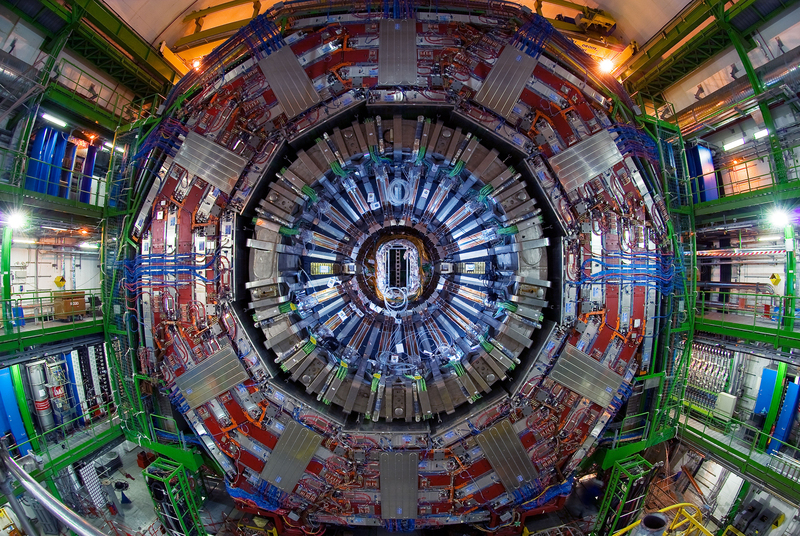 The July 4, 2012, announcement on the Higgs boson rested on data from Atlas and the compact muon solenoid (CMS), LHC’s two monster detectors. Indeed, the signal for a new particle reached the necessary “5 sigma” level, indicating that the chance of error was about one in 3.5 million. But that certainty did not extend to the question of whether it was indeed a Higgs. I’m positive on the negative! While the search for the Higgs is usually presented as a quest to plug the last hole in a theoretical contraption called the Standard Model, some physical contrarians hope the boffo boson will not turn up or will prove to be significantly different than expectations. 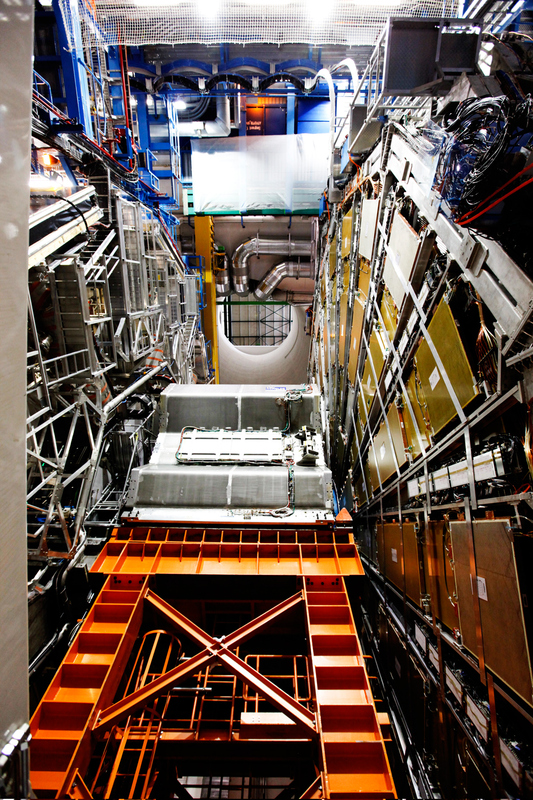 Discovery of “God” particle is announced — sort of! 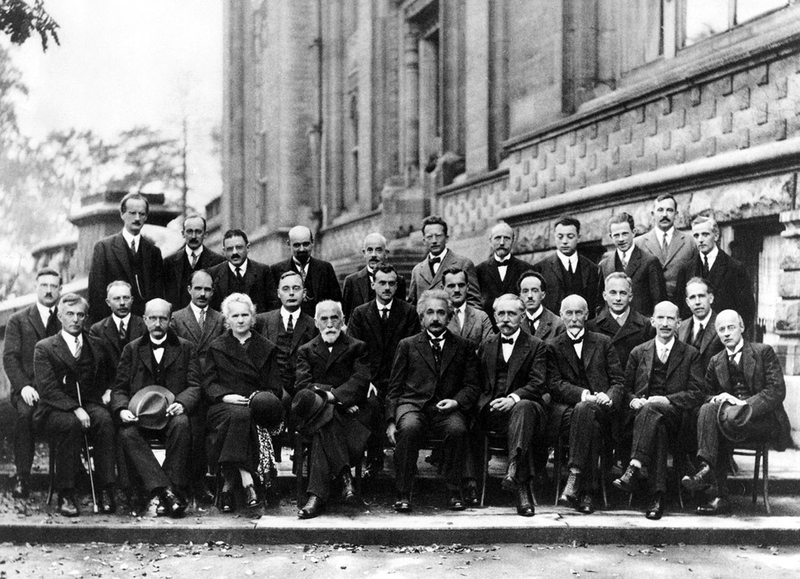 Either eventuality would add zeal to the search for new theories of matter, mass and energy, keeping that puzzled look on faces of physicists for decades to come. CERN plans to crank up the LHC soon, aiming to collect data for a definitive announcement on the Higgs by the end of 2012.